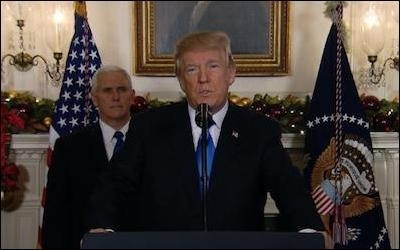 Donald Trump's recognition of Jerusalem as the capital of Israel is the most bipartisan decision he's made as president. In 1995, the United States Congress, with an overwhelming bipartisan majority, passed a law declaring that "Jerusalem should be recognized as the capital of the State of Israel; and the United States Embassy in Israel should be established in Jerusalem no later than May 31, 1999." This law, passed by a whopping 93-5 when Bill Clinton was president, had no effect whatsoever on the Camp David Peace Process which would have given East Jerusalem to the Palestinians as the capital of their sovereign state had Palestinian Authority Chairman Yasser Arafat said yes instead of no and chose peace rather than war. That law was reaffirmed in the United States Senate just six months ago by a unanimous vote. Chuck Schumer, the Democratic Senate minority leader, co-sponsored the bill. And just two months ago, Schumer slammed Donald Trump for not keeping his campaign promise to recognize reality. "This year," Schumer said, "is the fiftieth anniversary of the reunification of Jerusalem, yet with 2018 fast approaching, the U.S. still hasn't moved the embassy or made clear its commitment to Israel's capital...President Trump's recent comments suggest his indecisiveness on the embassy's relocation. As someone who strongly believes that Jerusalem is the undivided capital of Israel, I am calling for the U.S. Embassy in Israel to be relocated to Jerusalem. Moving the embassy as soon as possible would appropriately commemorate the fiftieth anniversary of Jerusalem's reunification and show the world that the U.S. definitively acknowledges Jerusalem as Israel's capital." A sovereign nation has the right to choose its own capital. Those are strong words, and far more inherently controversial than Trump's. Schumer used the word "undivided" and "Jerusalem" in the same sentence while Trump went out of his way to say instead that "We are not taking a position of any final status issues including the specific boundaries of the Israeli sovereignty in Jerusalem or the resolution of contested borders. Those questions are up to the parties involved." What differentiates the president from the Democratic minority leader is that Trump—correctly, and crucially —says the final borders in and around Jerusalem need to be negotiated between the Israelis and Palestinians. It's the only way the Palestinians would have a real shot at having part of Jerusalem as their own capital. Without that, they may never be willing to sit down and negotiate in good faith. It's a wonder that Trump's statement reflects this while Schumer's does not, but that's where we are. Trump's is more moderate, more reasonable, more nuanced than that of the Democrats in Congress. We certainly aren't accustomed to nuance from the 45th president of the United States, so if you like that sort of thing, enjoy it while it lasts, because it certainly won't. If Trump had used the word "undivided" as Schumer did as recently as the 10th of October, the case that he prejudged a future peace process would have merit. But that's not what he said, so it doesn't. Jerusalem is Israel's capital for a basic and incontrovertible reason. With the single exception of the Ministry of Defense, it's where Israel's government buildings are located. That, and nothing else, is what makes a nation's capital its capital. And as Senator Ben Cardin (D-Maryland) said on CNN Wednesday, "a sovereign nation has the right to choose its capital." No nation on earth—not the United States nor any other—has the right to deny another nation its capital. One may wish that Israel's government buildings were located in Tel Aviv—or, in Hamas' case, nowhere at all—but they aren't. They're in Jerusalem. Specifically, they're in West Jerusalem. None are in East Jerusalem, which is mostly Arab and wasn't even part of Israel when the nation was founded in 1948. Jordan occupied East Jerusalem then, although it was not part of Jordan. Jordan formally annexed it, along with the West Bank, in 1950, but the international community largely didn't recognize its annexation. Israel didn't acquire East Jerusalem until the end of the Six Day War in 1967, when Egypt, Jordan and Syria prepared to invade the country with plans to destroy it. The Israelis pushed the Jordanians out of the West Bank entirely, then annexed East Jerusalem. Again, the international community didn't recognize its annexation. East Jerusalem, then, still to this day belongs to no state in particular according to most of the world. Its final status has yet to be negotiated. Maybe Israel will keep it and maybe it won't—and it probably won't. The Israelis have already offered up East Jerusalem, and the Palestinians would have it by now if they'd said yes. West Jerusalem is another story. Israel will only lose it if an Arab army invades and destroys the country. Fat chance of that ever happening. No Arab army has ever been strong enough or competent enough to take on the Israelis and win. The United States would almost certainly come to the rescue on the off chance that Israel couldn't handle an invasion on its own. We rescued Kuwait from Saddam Hussein, after all, and would be doubly or even triply motivated to help an actual friend and ally. Whatever happens to East Jerusalem, West Jerusalem is Israeli - period. Arab countries aren't even interested in invading or destroying Israel anymore. They've lost enough wars already and moved on a long time ago. Many of them—especially in the Gulf region—are not-so-secretly establishing a de-facto alliance of sorts with the Israelis because they have common interests and common enemies in the region, namely Iran and its proxies in Lebanon, Yemen, Syria and Iraq. Whatever happens to East Jerusalem, West Jerusalem is not going anywhere. It's Israeli—period—and everyone knows it, including the Palestinian Authority and the Arab states even if they're too afraid of their own extremists to say so in public. Some may wish Israel's government and institutions were located instead in Tel Aviv. The Israelis won't move them until the sun rises in the west and sets in the east, until the seas go dry and mountains blow in the wind like leaves.